A Massachusetts man was arrested in Hudson, New Hampshire, after police say he was caught in the back of a U-Haul with stolen donated clothes. For Hudson police Capt. Bill Avery, this was a first. "I have never seen it in my career," he said. "Eighteen-hundred pounds of clothing is a lot of clothing and we have limited space to store our evidence." Police say a woman called 911 after seeing three men taking bags out of the Planet Aid donation bins in Hudson and throwing them into a U-Haul truck. When police arrived, they say 21-year-old Kevin Furtado of Brockton was inside the truck, but took off running. Officers caught up with Furtado and charged him with resisting arrest. They say the truck was jam packed with 1,860 pounds of stolen items. 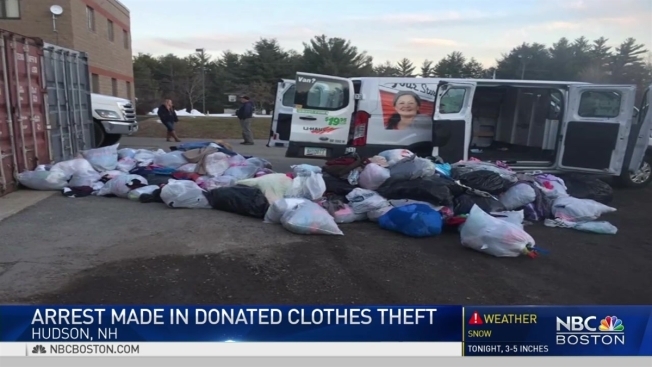 "I can only assume they must be in a dire situation to have to steal from a non-profit organization," said Patrick Holland the operations manager for Planet Aid Northern New England. Planet Aid collects donated clothes, sells them and then uses the proceeds to fund projects in third world countries. Representatives say to steal all of this, the suspects must have hit several drop-off locations before being caught in Hudson. "I would say it to anyone, to have a conscience when you're committing a theft, of who you might be hurting," Avery said. "You're hurting the less fortunate." Police say there were three people involved in this crime. They expect more arrests and more charges in the coming days.